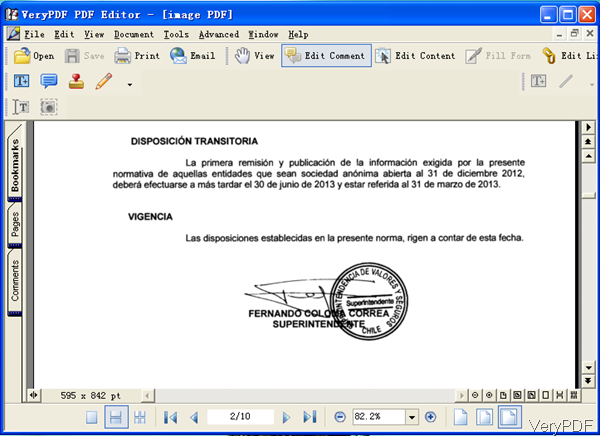 ← How to check PDF spelling error without MS Word installed? What program can edit a scanned document and then print it ? Question: I have Firefox on my computer and I need a program to allow me to edit text in a scanned document and then print it. I prefer it to be reasonable easy to use as I am not a guru at computers. Does anyone know of a program that can do this for me? Thank you for your help. Answer: When you need to edit scan file and then print it by some easy-to-use application, maybe you can have a free trial of software VeryPDF PDF Editor, which allows you to edit scan file either in image formats like EMF, WMF, BMP, JPG, GIF, TIFF, PNG, TGA, PCX or in scan PDF file. Most important, it is extremely easy to use. In the following part, I will show you how to use it. This software is Windows GUI version and it sells at $89.95 for each copy. When downloading finishes, there will be an exe in downloading folder. Please install this software by double clicking the exe and following installation message till short up icon showing off on desktop. When you launch this software, please click the icon on the desktop. Editing scan file can be done in many aspects if you have PDF Editor installed. Say you can edit contents of text, graphics and shapes, editing comments, annotations and links. And you can add autograph, add stamp and others on scan file then print it. The following snapshot is from the software interface, please have a check. Please add PDF file to software by dragging it from its containing folder to software interface. There are many options listed on the top menu bar. Click Edit Comment option, then you can add text in any place of scan file and control text color, style and others, if you click Comment icon then you can add comment to scan file at any place, the comment type icon can be chosen. If you click stamp icon, you can add image or text stamp on scan file. If you click pencil icon, you can draw something on the scan file. When you click Edit Content option, you can edit any content of the text here, which means you can change text content, text style and others. When you finish editing, please do not forget to save changing by pressing Ctrl+ S. Then click option Print, you can print the edited scan file to a brand new paper document. If you need to know more detail operations, please search in our knowledge base. By this software, you can edit scan file and print it directly. During the using, if you have any question, please contact us as soon as possible. How to rotate the page while converting emf to pdf? How to convert documents of Microsoft Office PowerPoint to PPM? How to minimize margins when printing PDF? How can I shift page images in PDF files from the left or to the right? This entry was posted in PDF Editor and tagged edit scan file. Bookmark the permalink.